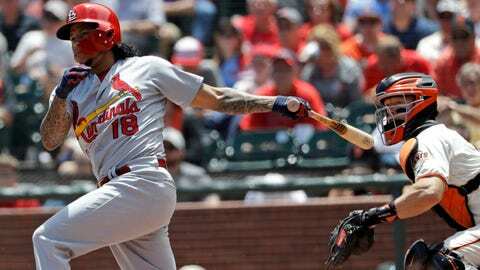 Carlos Martinez allowed just one run over seven innings and had an RBI double in the Cardinals' win over the Giants on Saturday. SAN FRANCISCO — St. Louis pitcher Carlos Martinez found his rhythm early, both on the mound and at the plate. Martinez pitched seven effective innings for his third consecutive win and doubled in the Cardinals’ first run in a 3-2 win over the San Francisco Giants 3-2 on Saturday. Kolton Wong had two hits and scored a run, outfielder Dexter Fowler added a sacrifice fly and Francisco Pena singled in a run. Fowler went 0 for 3 to drop his batting average to .168. Earlier this week, Cardinals president of baseball operations John Mozeliak appeared to question Fowler’s effort but later backed off those comments.